Now here’s a post we all want to read! Couldn’t you use some more happy? The key to happiness is obviously a whole lot more complicated than simple addition (x+y=joy). But maybe a “happiness equation” isn’t such a far-fetched idea: In fact, researchers at the University College London have developed a formula to accurately forecast the happiness of more than 18,000 people, Time.com reported. A big part of the equation had to do with expectations: low enough so you aren’t disappointed, but high enough that you have something to look forward to. So my first post is dedicated to those who HUSTLE. 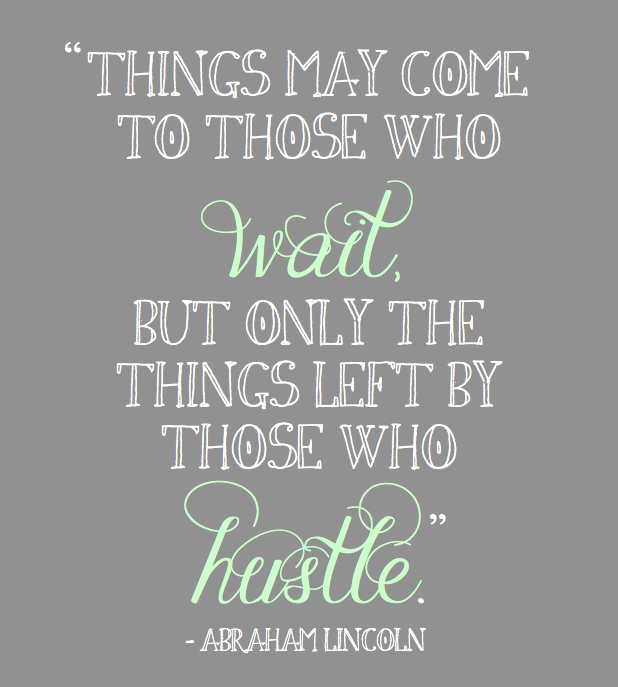 As Abe Lincoln stated so eloquently, us hustlers are the ones who accomplished the most while the rest is still waiting for the right time to act. There is no right time, except right now. So as I’m on the net reading up, preparing myself for my first week as a bonafide entrepreneur, I found myself feeling a little…..well, scared. I’m planning to approach businesses to pitch them my product and walk out of their establishment with an order. I won’t know most of them, all I know is that the products I am selling WORK, and that I am ready to WORK. With any luck I’ll be hustling all the way to the bank, and so will my customers! I’m still in the preparation/start-up phase and will soon be launching my own business, it’s more than I honestly bargained for. In all honesty, it’s SOOO worth it! In the meantime, remember there is no time like the present to go after what it is you want. Wether it’s to be happier, healthier, or wealthier, take some positive action right NOW. You’ll be glad you did, I promise. Ps: This original post was written when I first decided to join a MLM (Multi-Level Marketing) Program. I have since begun working on my true passion, which is helping Small Businesses get online and get noticed by their ideal clients. So I’m still hustling, and I hope you are too!